How Do I Receive Dental Implants? 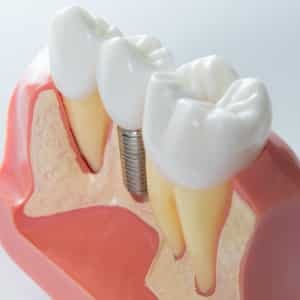 Have you ever heard of dental implant? These are a sturdier and more lifelike option for replacing teeth, especially when compared to dental bridges or dentures. People often ask, “How do I receive dental implants?” The placement process involves oral surgery and can lead to a new tooth that looks and functions similarly the real thing. You can enjoy a whole smile and improved oral health. In order to be a candidate for implant placement you need to have an adequate amount of jawbone tissue to support the implant post. Patients who have lost teeth often suffer from a loss of jawbone density, meaning they may require bone grafting to receive new teeth. In addition, your gums should be free of periodontal disease. Otherwise, the disease can lead to implant failure. Fortunately, we have treatment options to help reverse and/or manage the disease. First, the doctor will use digital x-rays and intraoral cameras to decide the best place the insert the new implant posts. The doctor will administer a local anesthetic before placing the implant into the jawbone. The area will need between four and six months to heal, in the process the new tooth bonds with the bone tissue. Finally, an abutment is added to the post that holds a restoration in place, completing your new tooth. You should brush and floss all of your teeth, including your new ones, every day. You should also see your periodontist for a routine checkup and cleaning. The doctor can then monitor the new tooth. If you have any questions about missing tooth replacement then contact our office today.